2018 brought me to some super cool places. Many of which were new experiences for me and made some everlasting impressions about where to live and train in the future. I thought I would take a bit of an analytical approach and rank the coolest, most far-out and legendary places I visited this year. We got some very interesting results here. 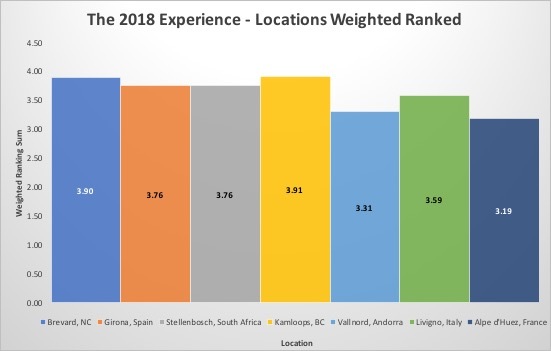 It seems that all of the locations do really well – probably because they are all super rad and world class! What is interesting is how the results change between the sum of the ranking and the sum of the weighted ranking. 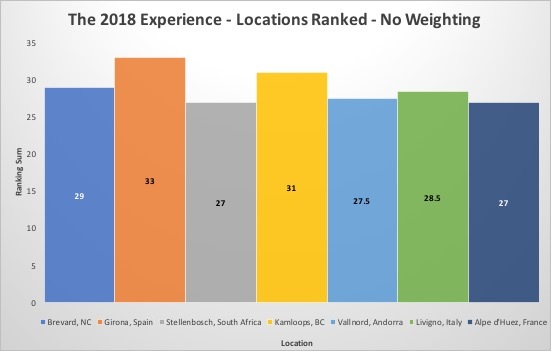 Kamloops is our weighted ranking winner while Girona takes the cake if you look at all the criteria equally. Reason for this: the quality, quantity and radness of the mountain bikes trails was weighted heavily for each location. Kamloops has a solid trail network in which only Brevard or Stellenbosch could compete with (honourable mention: Vallnord. Sick trails, just very gravity oriented). Be mindful that we are talking only about these locations, I am well aware there are other unreal trail networks throughout the world. Additionally, while Girona is killing it in the roads, variety, lifestyle and living cost departments, its downfall is with its trails. We found trails during our week there, but they weren’t anything to write home about. However, they were adequate and have put Girona on the map for myself as an all encompassing training location. The killers of Vallnord and Alpe d’Huez were their lack of ease of access. It would not be easy to get to these locations without a vehicle and would be even more difficult to survive once there. I’m by no means saying impossible, I’m sure with adequate planning and a little strategic accommodation location you could make everything walking distance but the fact still remains that you’re way up in the mountains. Although these are unbelievable spots, they fell short while using these metrics. Livigno’s poor performance was a little bit of a shock to me since the week we spent there was phenomenal. However, when the metrics broke it down and I cracked open google maps I realized that the road riding was in fact very limited. Go south, hit Switzerland. Go north, hit a single lane tunnel into Switzerland. Go east, descend 15km into Bormio. Therefore, the variety of the road riding (although amazing) is limited. At first glance there appears to be 3 major loops, all of which go through Switzerland at some point. Therefore assuming you’d reverse the direction of the loops you have 6 rides. There are tons of opportunities for out and backs like riding 55km out to the top of the Stelvio and 55km back each day. It would be relatively flat. It is noteworthy that during our time in Livigno all I rode was my Revolver HT. It seemed to be the perfect bike as there were bike paths, gravel paths, back-valley mountain passes and it really opened up many more loops. As mentioned in the table, most epic ride ever (complete with 15km twisting descent, hundreds of switchback climb, a sick view, an alpine lake with dams that look like they are from the Hunger Games, and a loop through a back valley that would make you feel like you were in the middle of nowhere but there are people sun tanning randomly throughout the valley) can be found HERE. All-in-all, 2018 was a rad year. We saw some epic stuff and visited some amazing locations. Like what you saw here? Don’t agree with me? Agree with me? Think I’m an idiot or ranked something unfairly? Contact me. We’ll wrestle over it.